So you’ve picked yourself up Apple’s new Watch Series 4, and now you’re looking for some alternative stylish, leather bands for the watch. There’s a lot out there, and in all different types of brands, materials, and styles. That said, there’s a wide variety in budget range for these leather bands as well, which can make it difficult to nail down a quality one for the Apple Watch. That’s why we’ve assembled only the five best leather bands for Apple Watch below — if you’re interested in picking a decent one up, be sure to follow along with us below. Here are our top picks. 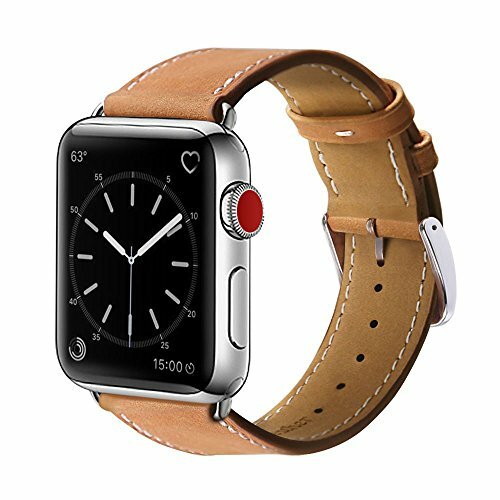 Looking for a leather Apple Watch band made out of real leather? Look no further than what Kades is offering in their own Apple Watch Band. Kades knows that every piece of leather has its unique texture, therefore, the company uses real leather for its watches, and as a result, every band they sell looks unique. Kades says that it even adds a little bit of a retro look to your Apple Watch. The band may be a little stiff when you first put it on, but it will soften with continued use, just like new shoes! There are a couple of different colors that you can choose from, but we like the original, genuine color. Fullmosa is next on our countdown. Made out of genuine, top-grade leather, the Fullmosa Watch Band bring you leather is soft and durable, and won’t irritate your skin. It has a comfortable feeling, making it optimal for all day wear. Additionally, it can keep long lasting character as it ages, as it is real, genuine leather — not faux leather. The Fullmosa Watch Band has a lot going for it, and they do have that original brown color that most opt for; however, Fullmosa has a wide variety of colors and dyes that you can use with your new watch band. Coming in next on our list, we’re taking a look at the MARGE Plus Genuine Leather Band for the Apple Watch Series 4. As the name of this band implies, this one is made out of genuine leather, and it actually has a metal buckle. The primary color here is Brown, but Marge Plus does offer it in a variety of other leather colors as well. This one isn’t made out of luxury real leather like Hermes, thus it’s available at a much cheaper price point. This one is actually compatible with both the 44mm and 42mm Apple Watch. If you’re looking for something that has a little bit more of a vintage leather style, then the MIFA Leather Band will be right up your alley. It has a “worn” look to it, which will really make your Apple Watch Series 4 stand out from the crowd. This one is actually available in a variety of different colors, allowing you to make a choice that is most optimal for the situation you’re in — such as a night out on the town, a business meeting, or for day to day use. This one is made out of genuine leather, and has a stainless steel buckle. Coming in next up on our list is the Leather Band by WFEAGLE. 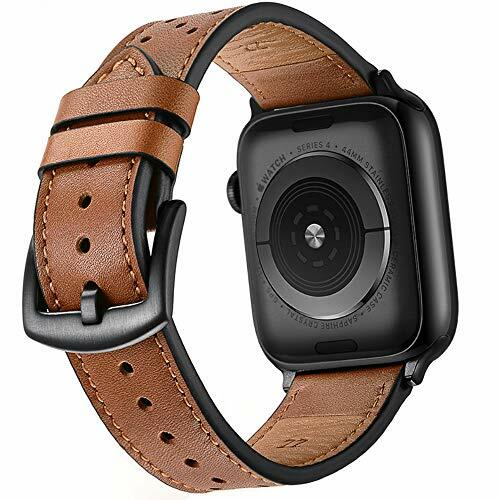 If you don’t want to spend too much on a leather band for your Apple Watch Series 4, and you’re looking for something that’s fairly versatile in terms of color, then this one will be right up your alley. It’s versatile because — on their Amazon product page — there’s actually 44 different colors and styles that you can choose from. All bands are made out of a top grain genuine lather, and they all have a stainless steel clasp or buckle for securing the watch to your wrist. Coming in near the bottom of our countdown, we’re taking a look at the Benuo Leather Band For the Apple Watch Series 4 — a vintage series of leather bands. This one is fairly unique because it has an old, almost stained appearance. It’s actually very stylish looking, and will make your Apple Watch Series 4 stand out in any situation. This one is optimal for almost any situation, whether you’re looking for general, day to day use, something for business meetings, or even a night out on the town. This one is particularly nice because Benuo offers this vintage leather band for both 38mm and 42mm sizes. 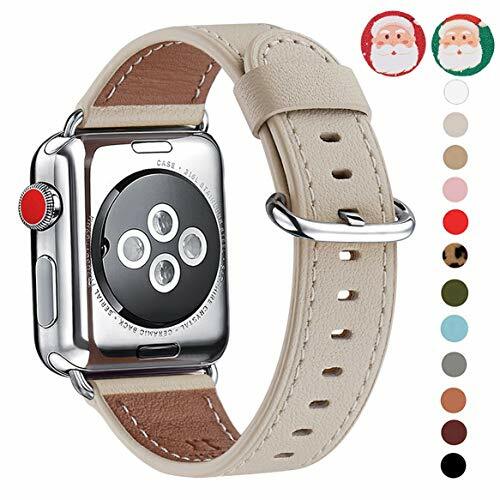 At just $18, this is a fairly stylish leather band that you can pick up for your new Apple Watch. Coming up as last, but certainly not the least, we have the Secbolt Leather Slim Wristband. This one comes in 16 different colors and styles, and at just $15, it’s fairly affordable for almost anyone. 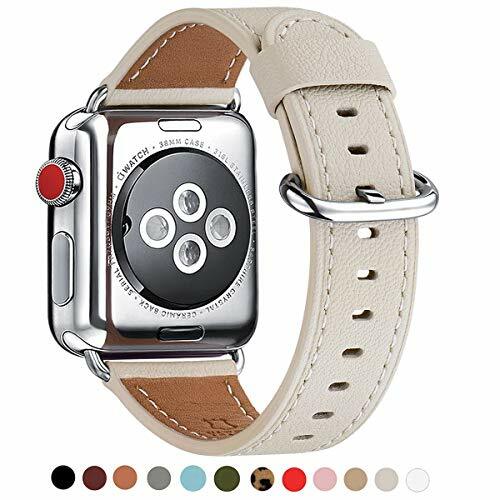 If you don’t want a traditional leather band for the Apple Watch, this slim one will help you keep a fairly low profile. You can use this one in business meetings as well as a night out on the town — it isn’t a bad option for day to day use either. It has a stainless steel clasp for securing the band/watch to your wrist. Uniquely enough, this one actually comes with a 1-year warranty in the event that anything happens to it. 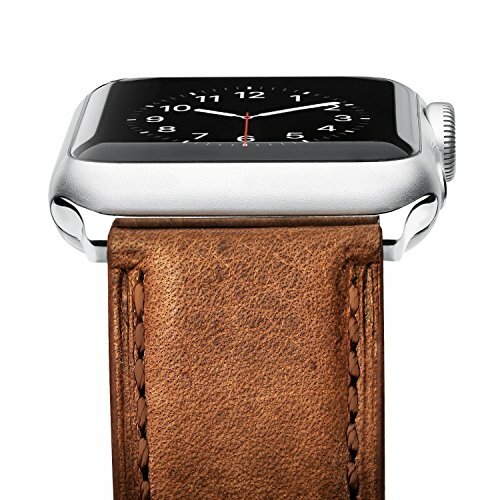 As you can see, there are a lot of excellent leather Apple Watch bands out on the market. Really, any one of these will upgrade the style of your Apple Watch, making it a little more appropriate for things like business meetings, a night out on the town, and more. 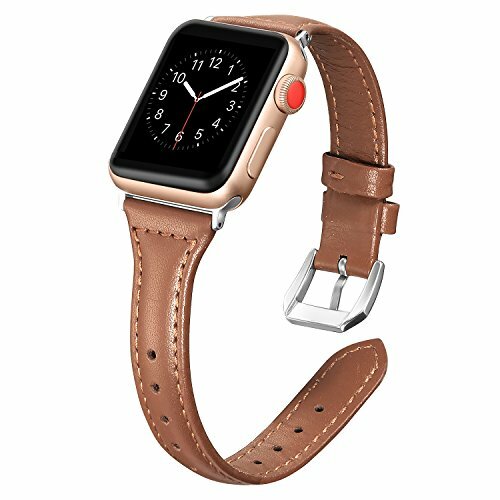 Do you have a favorite leather band for your Apple Watch? Let us know what it is in the comments section below. We’d love to hear from you!